Art inspired by colourful mandalas made by Tibetan monks is on show at Coventry’s Central Library. The drawings and glass paintings were made by members of Arty-Folks, a group for people recovering from mental health problems. Art tutor Lorella Medici said the works describe how the person feels about themselves in relation to the world around them through patterns, mark making, textures and colour. The works have been inspired by the mandala, which in Sanskrit means circle. Mandalas are spiritual and ritual symbols in Hinduism and Buddhism, representing the universe. Lorella said: “Our minds are always busy seeking solutions for our many problems. Making these mandalas has helped people to concentrate on creating beautiful and meaningful artwork, and to give their minds a rest. Jean who is one of the people exhibiting says: “I used to believe that art is just for people who are very creative, imaginative or skilled. I started coming to Arty-Folks after I lost my mum and it motivated me to get out the house at least once a week. 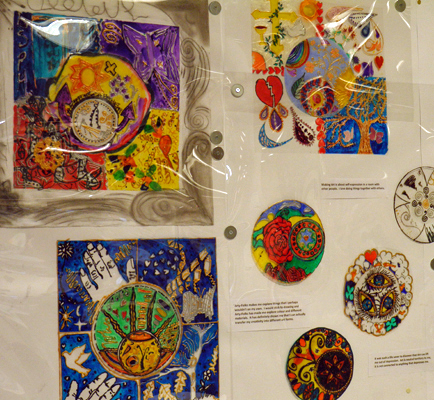 The display includes as step-by-step instruction on how to create your own mandala art. Arty-Folks meets from 12.30-2.30pm on Wednesdays at the Artspace Studios, 15 Lower Holyhead Road, Coventry. Anyone interested can pop in on a Wednesday, or call 024 7641 4740 for more information. The exhibition at the library is on until November 16. Also see www.arty-folks.co.uk and Arty-Folks on facebook and twitter.